For real-estate developers in the city, the sky is not the limit. Shanghai, already crowded with skyscrapers built on the back of robust economic growth and financial might, will be home to the country's tallest building in Lujiazui financial zone of Pudong New Area. 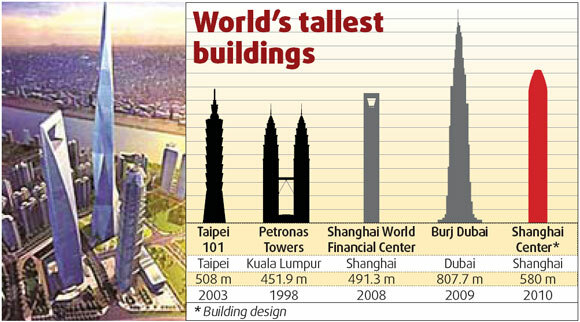 Construction on the proposed 580-m building, among the world's tallest, will start this year, Xinhua News Agency reported. The Shanghai Center, reportedly scheduled for completion by 2010, has been approved by the city's development and reform commission. The project will be jointly developed by Shanghai Chengtou Corporation, Lujiazui Finance and Trade Zone Development Co Ltd and Shanghai Construction Group. The cost has not been revealed. According to a design by Skidmore, Owings & Merrill (SOM), a Chicago-based architectural and engineering firm, the 118-story center will dwarf the nearby 491.3-m Shanghai World Financial Center (SWFC), which is expected to be completed this spring, and the 420.5-m Jinmao Tower. Taking up 20,300 sq m, the Shanghai Center is expected to house offices, hotels and shopping malls as well as recreational facilities, complementing the two neighboring buildings with more office space for financial institutions and companies as the district sees an increasing inflow of foreign capital. According to a recent survey on office requirements of foreign firms in Shanghai conducted by Mori Building Co, office quality is becoming increasingly important when financial companies seek expansion. The survey also found that Lujiazui remains the most popular office location in Shanghai. "Competition over the world's tallest building seems inevitable as the city moves steadfastly to become a world-class financial center," Michiho Kishi, deputy general manager of public relations at Mori Building Co, the real estate developer behind SWFC, told China Daily. "High-quality and prestigious office space can attract a highly educated workforce, which in turn will contribute to the city's status as an international financial hub." In the past two decades, Pudong New Area has developed from a rural backwater into a financial district which is home to scores of financial institutions and internationally renowned companies.